Andy Alexander, S.J., is a Jesuit priest who serves as director of the Collaborative Ministry Office, and co-founder of the Online Ministries website, at Creighton University in Omaha, Neb., where he also grew up. He is the co-author of two books, Praying Lent: Renewing Our Lives on the Lenten Journey (2009) and Retreat in the Real World: Finding Intimacy with God Wherever You Are (2008), both from Loyola Press. His writings on spiritual topics have also appeared in a variety of venues including the Ignatian Solidarity Network website. I recently interviewed Father Alexander by email about his work to share Ignatian spirituality online. You work with Creighton University Online Ministries. 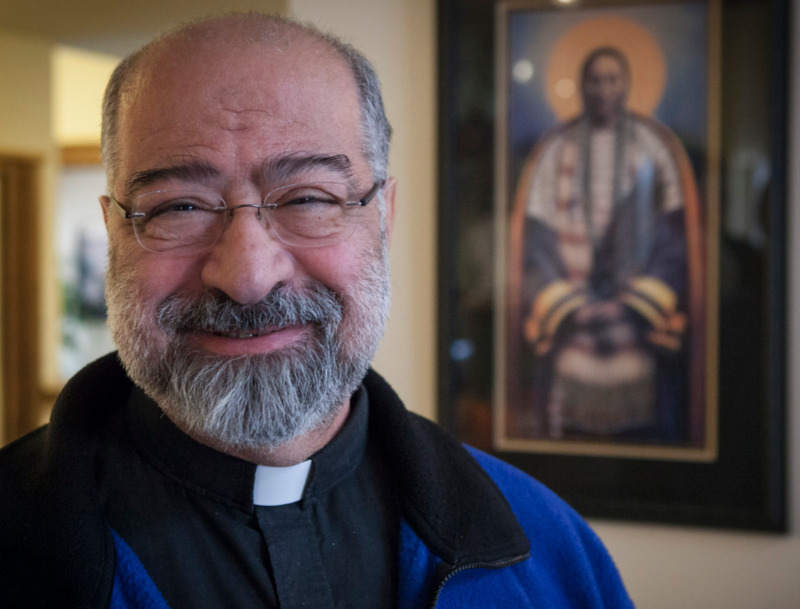 How does this ministry bring Ignatian spirituality to people in a new way? I think our Online Ministries helps very busy people connect with a spiritual tradition that believes we can seek and find an intimacy with our God in the very midst of our complicated lives. I think the “newness” of our site is that we try really hard to avoid “jargon” and to say quite down to earth. And, as we’ve gotten feedback from all over the world, we’ve been able to keep adapting it to respond to needs people told us about, to requests people made of us. When Maureen McCann Waldron and I started the Online Ministries web site, we developed it to support our own faculty and staff, for their nourishment, so that they could contribute to our Catholic and Jesuit mission. We started with a group of faculty and staff whom we invited to write daily reflections on the daily Scripture readings. When we started getting feedback around the world, we realized how helpful this was to hungry people everywhere, and how powerful the web was becoming. Our own faculty and staff started asking us to help them enter into the Spiritual Exercises, so Maureen and I spent eight months “translating” Ignatius’ movements into an online experience that busy people could do. Larry Gillick, S.J., added a reflection to each week and Don Doll, S.J., gave us a photo for each week. Then, we got requests to put the retreat into various languages and so it is now in seven other languages, including Chinese and Arabic. Then, we were inspired by stories people sent us to prepare resources that had to do with the seasons of the church year, so that is how we created the Praying Advent, Praying Lent, Celebrating Christmas, Celebrating Easter and the Praying Ordinary Time sites. The number of Jesuits who give weekend retreats at our retreat house outside of the Twin Cities led us to ask the retreat house to record those retreats and we put them on our website, a tremendous resource for people who can’t afford the time or money to make those retreats. Catholic websites, including other Ignatian spirituality portals like Sacred Space, sometimes feel like they are a dime a dozen nowadays. How does Creighton Online Ministries stand out? I think we stand out mostly because we got into this very early. We were among the first spirituality sites in the world when we began in 1998—just about nine years after the web began. And, we were linked all over the internet. I think we also had an advantage in that we had, over all these years, about 50 faculty and staff who wrote our daily reflections. Having these various and diverse voices have helped a lot of people. We have focused on helping ordinary people find intimacy with God in their everyday lives. I think we worked very hard at keeping it non-theological and very pastoral and kept shaping what we offer based upon the feedback we received. Finally, we made a key decision in the early days based upon the fact that we were hearing from a lot of people in the third world, with very basic internet connections. So, we’ve kept the site simple and avoided a lot of bandwidth hogging stuff that might be flashier, but could cut out people on the very margins of technology. I think we’ve inspired a lot of imitation and innovation. The movement to serve and promote the faith online has been one of the great worldwide movements of the past 18 years. What principles of Ignatian spirituality, including sources like the Spiritual Exercises, are most conducive to online ministry? A key inspiration which came to us early on in our preparation of our version of the movement of the Exercises was to ask what outcome Ignatius desired for someone who makes the Exercises. Taking our cue from his text, he wanted people who could discern the movements of God in their hearts and could apply that in finding intimacy with Our Lord and Savior in everyday, busy life. So, we made that desired end into a means for designing the retreat. We resolved to help people learn to become contemplatives in action, while they made the retreat. So we offered a “Guide” for each week, which we invited people to place in the background of their daily life—interacting with the real things of their life. Each week, there are graces to ask for and a way to reflect upon those graces while we are moving through our life. What are some of the graces you’ve experienced in this ministry? One grace has been to simply know how many people are being served. We noticed years ago that we can work very hard to prepare a talk for a crowd of 50 people on campus, and then we can write a reflection or a resource which is opened 5,000 to 6,000 times in the next week and remains there as a resource for a long time. Another grace has been the feedback we’ve received from very special places. A woman wrote from Haiti about how our site gives her strength in her faith and trust in God in her hopes for her family and her nation. A woman wrote us from Saudi Arabia where her Bible, crucifix and rosary were confiscated at the border when she went there with her husband for his work. She wrote to tell us she was making the Exercises in Riyadh, far from any retreat center. A woman in a war zone in northern Serbia wrote to say that it was a blessing for her to listen to Father Shanahan’s retreat, which she downloaded to her MP3 player, as she rode her bike to work. Bishop Jin (the now-deceased Jesuit Bishop of Shanghai) consoled us when he wrote to ask us permission to print our retreat in Chinese in his monthly magazine reaching the people of the People’s Patriotic Catholic Association and beyond. Many stories like these have been experiences of grace for us. What are some challenges you’ve faced in the work? In the very beginning, some people mocked us for using the web at all. They said it was a “toy” and that it wasn’t a place for serious work and certainly not a place for a spiritual ministry. Some Jesuits wrote to object to our adapting the Exercises in the way we did. They said that people were not really making the Exercises. We responded by explaining that we were clearly offering “the movements of the Exercises.” We also explained that it seemed that the only way of making the “full Exercises” was to make a 30 retreat, as Ignatius describes it in Annotation #20. Everything else—including eight-day retreats, preached retreats, weekend retreats—are all an adaptation of the Exercises. I remember asking one Jesuit if he would be happy if I told him that thousands of people were using our site for “spiritual reading.” He agreed that would be good. Then, I asked if it would be good if that reading was around the themes of the Exercises, and he again agreed that this would be good. Finally, I asked if he thought it would be good that some people were actually praying while they were doing this reading and reflection on the movements of the Exercises. And, he finally agreed that would be okay. What sort of feedback do you hear from people? One of the great decisions that we made early on was to allow the site to be interactive. So, at the first level, each daily reflection allows a reader to write directly to the writer. When any of us writes a reflection he or she gets quite a number of emails from people expressing their gratitude and sometimes sharing why something in the reflection touched them. That has kept all of us writers grounded in the experience of people and full of consolation. Many Catholics want to pray, and some even want to make an Ignatian retreat, but retreat houses and books often cost more than they want to commit. How does Creighton Online Ministries relate to more traditional ministries of Ignatian spirituality? We have heard from a number of retreat houses, telling us that they refer their retreatants to our site. They do not see us as “competition” to their work but a tremendous resource for their retreatants. And, quite a few people who have tasted this spirituality on our site have found a spiritual director, or read more, or made a retreat at a Jesuit retreat house. What would you say to someone about trying Ignatian spirituality for the first time? We tell people making the online retreat for the first time to “Trust God. Trust yourself. And, trust this process.” We also tell people what Pope Francis has been saying. Prayer is a relationship. It is not saying prayers, but a personal relationship. I took part in the Creighton online retreat some years ago and I thought it was a really worthwhile experience. Not everyone can afford to spend 30 days or even a weekend at a Jesuit retreat house. Very true. Thank you for reading and sharing.